As the New Year approaches, the American tradition of reflecting on the year’s past and one’s own future comes to bear on us all. The ritual of a New Year’s renewal is certainly much older than our own nation. According to historians like Michael Kammen, the New Year had always brought a cultural urge in Americans to take stock in the past, and orient one’s self towards a perceived future existence (and by implication one’s present existence). In relation to my investigation and understanding of San Francisco’s collective identity in the 1890s, public New Year’s celebrations offer a similar window into glimpsing the city’s collective identity as other participatory public events such as California’s Admission Day presents. Observing how the city’s inhabitants celebrate this cultural tradition reveals how individuals and groups understand their shared urban society’s existence in time. Similar to Washington’s Birthday, California’s Admission’s Day, and the Fourth of July, mass public celebrations demonstrated symbolic representations of the society’s social order and collective self-awareness. As the San Francisco’s regional economic and cultural dominance began to be significantly challenged by other Pacific urban centers like Los Angeles and Seattle, the city’s uptick in the 1890s inspired a new debate in the public sphere on the city’s regional status and future. Exemplified in James D. Phelan’s oration on opening day of the 1896 Mechanics’ Fair, San Francisco’s commercial-civic elite saw the dawning of a new era as the ending of the century neared. What was San Francisco’s role within the western most region of the American nation? How did the city’s residents see the New Year in relation to their city? One glimpse of the answer to these questions can be found in observing and analyzing how people participated in these festivities. To San Franciscan’s in the 1890s, New Year’s Eve seemed to represent a moment in which the garments of 19th century civilized life could be shed to reveal resident’s primal human nature. “Man is a peculiar animal,” the Call reported. “There are times when he seems to forget…that he is supposed to be human.” And on New Year’s Eve in the city, one seemed to forget all the fineries of cultured civilization and let loose into the streets. 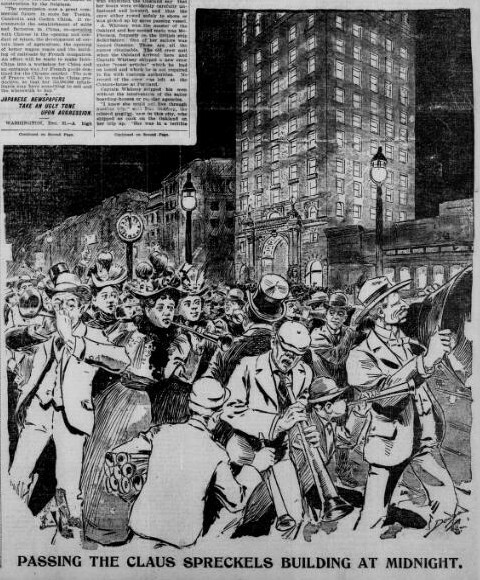 New Year’s Day headlines reported a boisterous performance by the residents of the city. “It used to be only the small and enthusiastic boy who blew a horn at midnight on the coming of the year,” the Chronicle observed, “but from the modest beginning has grown a carnival of huge proportions, in which join young and old, rich and poor.” Celebrating the new year with unrivaled enthusiasm and hope was not just a childish act. For San Francisco New Year’s Eve was a ritual expression of societal unity and the city’s collective identity. Hundreds of thousands of people were reported to have participated across the city’s busiest streets “jammed with people.” The significance of such widespread participation is demonstrated when one observes the imposed cultural order by the city’s more powerful groups. This popular unity of action demonstrated among other things that San Franciscan’s perceived themselves as moving together through time as a composite society, despite the population’s actual diversity. Throughout the streets hours before the “‘Chronicle'” clock’s “great bronze pointers clasped hands and united” at midnight, the city had grown into a mass public carnival of cowbells, tin whistles, and rattle boxes. “Noise! More noise! Still more noise! All kinds of noise. Tinhorn noise. Noise of bells. Noise of rattles. Any old kind of noise, just so it was noise,” declared the Call. “There were plenty of women in it,” the Chronicle reported, “taking their share in the rough sport.” And “about midnight,” the Call noted, “all the faces were turned like flowers to the sun of the ‘Chronicle’ clock, bravely shining away up in the dark,” waiting for the first hour to strike of 1898. Was the celebration as unified as the reports claim? The celebration was reportedly imbued with an unusual character of “camaraderie that peculiarly distinguishes the carnival” from other celebrations. Like flowers bound to face the sun, in collectively celebrating the coming New Year San Francisco’s diverse residents demonstrated what they understood to be a shared community moving through time. But sharing did not imply equality, or even equity. Public celebrations also offer minority groups the chance to participate in the dominant culture for acceptance and in some cases to redefine their own identity within the dominant cultural hierarchy. “Even the Chinese residents…were amazed at…those who were eager to notify the world in general and their immediate neighbor in particular that they were glad the old year was going and the New Year was coming.” It is significant especially for the Chinese, as their own Chinese New Year celebration would not take place for a couple of weeks, but this did not deter them from reinforcing their position amongst the society’s more dominant residents. Therefore, behind this unity of action stood a clear understanding, acceptance and reinforcement of the city’s social hierarchy. In shedding the garments of supposed San Franciscan civilization, the participants satirized and in effect reinforced the cultural order of the city’s established social hierarchy through costume, pageantry, and jubilation. The demographic profile of San Francisco in the 1890s demonstrated a dominance of Anglo, Irish, and German cultures, but also with significant critical masses of Italians, Chinese, and Japanese cultures. As the night intensified, the Chronicle reported, “boys [and girls] disguised themselves in grotesque and picturesque ways.” Whether a participant’s costume was grotesque or picturesque depended on their cultural orientation within the city’s hierarchy. False mustaches shot at you from beardless cheeks. False whiskers graced young lads who couldn’t raise them. False noses made the streets into rows of Shylocks. Several bands of boys…wore black stovepipe hats, with red bands and red streamers, and huge wreaths of holly above the brims, making them look like Italian minstrels, [while] throngs of boys crowned with diminutive ‘dicers,’ in Australian fashion, passed along. The Jewish, Italian, and Australian cultures that the participants satirized, represented in effect a reinforcement of the city’s social hierarchy by establishing these groups as worthy of attack. This satirical celebratory behavior is put into further relief when juxtaposed with the Call and Chronicle’s reporting of an almost “savage” event. What does it mean when a city’s collective annual tradition of a reversion to savagery is defined by satirizing the barbarism of its minority groups? Are the Australians or Italians more savage than a savage Anglo or Irish? If San Franciscan’s were shedding the burdens of civilization on New Year’s Eve, why were ethnic minority garments lying underneath? By satirizing the minority groups in San Franciscan society, the dominant cultures were in effect reinforcing their culture’s position above and over the city’s seething cosmopolitanism. In a time where Herbert Spencer’s ideas of racial evolution remained strong, the dominant groups of San Francisco expressed their own visions of the city’s racial hierarchy. If the broad story of San Francisco’s rise to regional dominance was defined by the city’s elite struggle for order, then by the 1890s the city’s social hierarchy was well defined and understood by majority and minority groups. For a celebration like New Year’s Eve of 1897 to occur, it was clear that dominant groups understood who was at the bottom of the hierarchy. While it seemed as the Chronicle reported a wide spread almost democratic celebration of the rich and poor, men and women took place, its result was anything but democratic. As historians Kevin Star and David Wrobel have noted, San Francisco’s cosmopolitanism (or the effective social control of diversity) was seen as a distinct identifier of elite San Franciscan culture and success. To the elites, the city’s growth among such diversity was a nod to the abilities of the upper-classes in ordering a disorderly city. But as Starr and Wrobel also point out, this perception of cosmopolitanism as a positive identifier of the city depended on the proper hierarchical ordering of the various inhabitants. In practice, the New Year’s Eve celebration reinforced the established cultural hierarchy by satirizing the ethnic groups within the lower rungs of the city’s hierarchy; in effect elevating and reinforcing the dominant elite’s position above and beyond Spencer’s racial hierarchy. You are currently reading San Francisco’s “Savage” New Year’s Eve: December 31, 1897 at Gilded Empire.